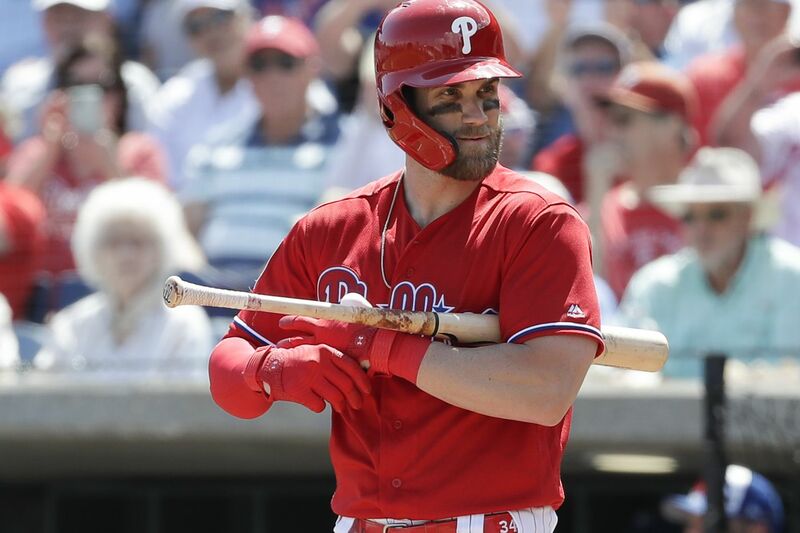 Phillies Bryce Harper before batting against the Toronto Blue Jays in a spring training game on Friday, March 15, 2019 at Spectrum Field in Clearwater, FL. “Welcome to Philadelphia, Bryce!” But don’t move to town outside baseball season, unless you want to pay a lot of extra taxes, advises Zach Hizer, veteran tax associate at city accounting firm Drucker & Scaccetti. To be sure, Bryce Harper will do his personal taxpaying part to plug holes in the Philadelphia city and Pennsylvania state budgets: He will pay a combined $17 million in state and local taxes — here and elsewhere — if he serves his full 13-year, record $330 million contract, based on current rates and part-time residence here, figures Hizer. But the two other top bidders, San Francisco and Los Angeles, in high-tax California, would have hammered the outfielder even more — $28 million in state and local taxes if he took San Francisco’s $310 million, 12-year bid; $15.2 million in just four years if he went to Los Angeles for its $88.8 million offer. Add in federal income taxes, which are far higher, and Harper will end up paying 44 percent of his Phillies income in taxes — vs. 47 percent at the Dodgers or 48 percent at the Giants. Not counting sales and property taxes. The estimate assumes Harper remains a permanent resident of income-tax-free Nevada, and pays the higher and lower rates in other states when he’s there for away games and spring training, so that about $42 of every $100 he earns will be earned at Citizens Bank Park and other Philadelphia locations. If he moves here more permanently, he’ll likely pay more tax. Drucker & Scaccetti is one of several accounting firms in the Northeast that sells special advice to athletes, entertainers, and other high-paid traveling pros who are targeted by cities such as Philly every day they are in town and pay a complex web of taxes on the road and at spring training. The big financial difference between Philly and the two West Coast towns Bryce spurned is California’s 13.3 percent state income tax, compared with Pennsylvania’s 3.07 percent tax rate. The Giants would have had to boost their offer to $340 million to pay off their home state and match the Phillies’ net wage, Hizer says. Pennsylvania will get a slice of the rate difference back because it is “one of the few states that always levies taxes on a true signing bonus” — which for Harper totals $20 million. By contrast, under California law Harper could have pocketed that fat bonus where he lives “in the tax-free state of Nevada,” putting it beyond Sacramento’s tax collectors, Hizer says. So Harper may find it convenient and profitable to spend, not just the off-season, but as many days off as he conveniently can back home in Nevada and other low-tax areas: People who spend at least six months in Pennsylvania and occupy “a permanent place of abode” here will be taxed “on all income regardless of where it was earned,” whereas temporary and seasonal workers can demand to be taxed just on the minority of days they are here. So “rather than owning a home in Pennsylvania, Harper might want to look into short-term, fixed lease agreements," Hizer concludes. The tax accountant credits John Middleton and the other Phillies owners’ generosity, and Harper agent Boras Corp.'s negotiating tenacity, with landing the record-breaking deal and the resulting windfall for area tax collectors. And Philadelphia, with its unusually long array of business sales, business income, sales surcharge, local wage, and property taxes, can thank California’s especially high-income-tax regime with making the Phillies’ hometown look like a relative bargain, for once.